I’ve been considering ordaining but have some doubts and questions. I live alone, and I feel alone. I have good work as a high school teacher, which gives me satisfaction. I exercise every day and excel at Kung Fu. I have a boyfriend. In fact, in the past I’ve had several boyfriends. However, I’m dissatisfied with me, with who I am, and thus with all aspects of my life. I know that if I apply the Dharma teachings, all that can change, and when I put energy into my practice, I feel the benefits. But still my practice is poor and the delights of samsara attract and distract me. But afterwards, I always see that the Dharma is the only way for me to really feel well and happy. I would like to become a monastic, but I don’t want this to be an escape. How do I know it isn’t? How do I know that this is the correct decision? I don’t have the usual wish to have children, and I believe that this says something. It’s great that you’re considering becoming a nun and that you’re also examining your motivation, wanting to make sure it’s not one of escaping problems. First, we can’t escape our biggest problems—our ignorance, anger and attachment—just by putting on monastic robes. Those harmful mental states still exist, so we definitely have to practice the Dharma in order to overcome them. The advantage of being ordained is that we have more time to practice and less distraction. 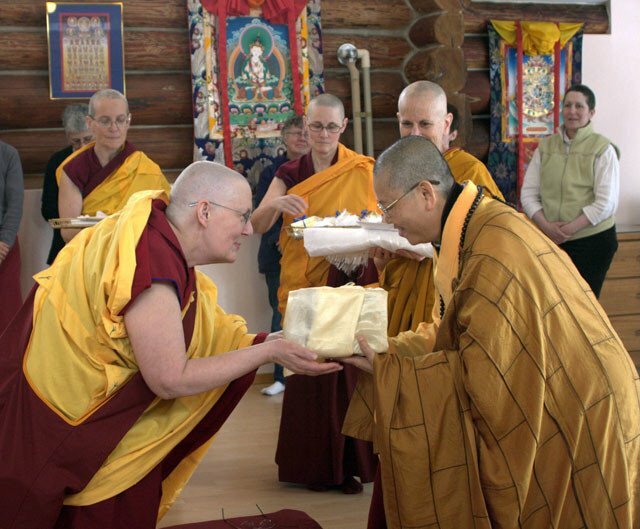 We receive the support of other monastics who are practicing and have more opportunity to listen to teachings. Plus, keeping the precepts itself is great purification and we create great merit, which make it easier to develop realizations. One way to tell if your motivation is to escape problems is to investigate, for example: Am I tired of this particular boyfriend or am I tired of having any boyfriend at all? In other words, do you see the situation of having a boyfriend, no matter who he is or how wonderful he is, as filled with problems and being suffering in nature? Or do you just wish to have a better boyfriend? You can examine this for other things you’re attached to (job, money, family, etc.). Of course, we will still have attachment to men until we realize emptiness, but as a nun we’re determined not to follow that attachment. We’re determined to face our attachment, see its disadvantages, and apply the antidotes to it. Similarly, in terms of being dissatisfied with yourself or feeling lonely, investigate: Is the problem external? Do I just want more praise, sweet words, and a nicer environment to feel good about myself? Or is the problem internal, one that comes from mental states that I need to transform? To become a nun, you don’t need to be a “perfect” practitioner. We become ordained because we aspire to practice and to transform our mind—let go of our faults, cultivate our good qualities, and actualize our Buddha potential. Before ordaining, arrange to live with other monastics, either in a monastery, abbey, or Dharma center. Living with other sangha and near your teacher is important to be able to keep the precepts. This enables you to study the precepts and have the support of the sangha community in keeping them. From your teacher and the sangha, you will learn what it means to have a “monastic’s mind,” that is, how Buddhist monastics train themselves to act, speak, think, and feel. Having learned this, your practice will go well and your ordination will be a joy for yourself and others. If it will take some time to arrange the proper living situation, I advise that you wait to ordain until that is done.